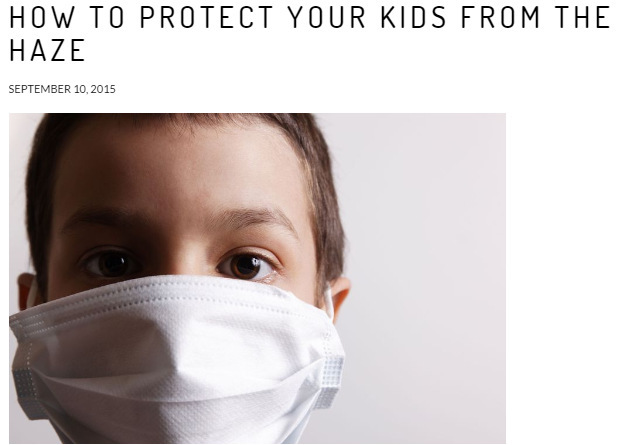 Dr Jovina See shares tips on how to protect your child's eyes from the haze. The haze doesn't just affect your lungs and nose, either. Dr Jovina See, clinical director at Shinagawa Eye Centre, explains that as airbone particles come in contact with the eyes, children may experience eye irritation in the form of grittiness (a sandy sensation), dryness, redness, itchiness or watery eyes. They may experience more mucous discharge, and intermittent blurring of vision as well, especially if they already have rhinitis, sinus problems or a history of conjunctivitis. Some kids may even get swollen eyelids. If any of these symptoms happen, keep them indoors and use an air purifier. Lubricant eye drops may help but if the symptoms persist, see an ophthamologist (eye doctor).